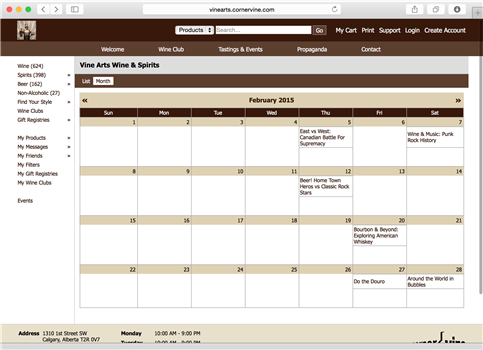 Manage your tastings, pairings, seminars, and in-store events. 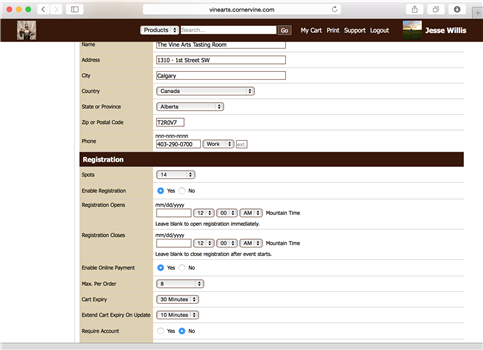 Create events, enable registration and payment, and manage registrations and cancellations directly from your CornerVine system. Allow your customers to buy tickets at the same time they're buying your other products. Control the number of tickets available, registration settings, how long unpurchased tickets can be active in a user's cart, and more. Announce your events to your customers through your existing social media accounts. Post a status update to your Twitter account with a link to the registration page. Add the event to the Facebook Events tool for your store's page. Show the event in the news feed of your store's Facebook page, which makes it visible in the news feed of the customers who have "liked" your page. Give your attendees an enhanced experience for tasting events. Each event can have an unlimited number of products associated with it. This means that when a customer is looking at the event, all products associated with that event will be displayed. When your customers are at the event and tasting your products, they can use your mobile app to quickly find a product and add ratings and tasting notes. If a customer loves a product while they're tasting it, they can quickly add it to their cart in your mobile app and buy it on the spot, or complete their purchase when the event is over. When a customer is back in your store, they will be able to quickly access everything that was available during the tasting to locate in your store and purchase.